The Prix du RAF awards program recognizes the outstanding contributions made by black Francophone women who have played -and continue to play - a key role in our community on both sides of the river: Ottawa and Gatineau. Since 2007, twelve exceptional women have been recognized. Admission: $35, special prizes for first 100 guests to arrive. 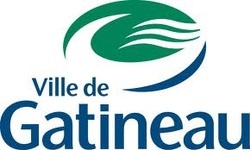 PRIX DIAMANT: This award marks the outstanding achievement of a black Francophone woman living in the national capital region (Gatineau or Ottawa). Come to the awards gala on Sunday, March 18th to see who wins! The RAF strives to motivate women and their families by organizing activities related to health, well-being and personal development. International Women's Day: Celebrating and honouring women and girls all over the world! International Women's Day (8 March) is a global day celebrating the economic, political and social achievements of women past, present and future. International Women’s Day was commemorated for the first time on 19 March 1911 in Austria, Denmark, Germany and Switzerland, following its establishment during the Socialist International meeting the prior year. More than one million women and men attended rallies on that first commemoration. 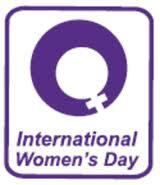 In 1975, during International Women's Year, the United Nations began celebrating 8 March as International Women's Day. Two years later, in December 1977, the General Assembly adopted a resolution proclaiming a United Nations Day for Women's Rights and International Peace to be observed on any day of the year by Member States, in accordance with their historical and national traditions. Women across Canada are as diverse as the communities they live in. This year's theme for International Women's Day and International Women's Week celebrates women's roles in the economic prosperity of rural, remote and Northern regions. approximately 5,200 of which are rural, remote or Northern. During the week of March 8, 2012, we are celebrating the three million Canadian women and girls across every province and territory who are integral to life in these rural, remote and Northern communities. 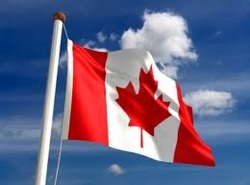 pronounced for Aboriginal women, who make up a large part of the rural, remote and Northern population. rural and remote areas can also be found across the country. conférence-causerie : Deux femmes au parcours inspirant! La Ville de Gatineau souligne la Journée internationale de la femme en presentant cette conférence qui mettra en valeur le parcours singulier de deux femmes immigrantes inspirantes et engagées. Une période de discussion suivra leur présentation. Venez découvrir les parcours de femmes d’exception! Conférencières : Madame Isabelle de Bruyn, directrice générale du Centre local de développement du Pontiac. Madame Marie Yanick Dutelly, artiste, écrivaine et poète. Le 8 mars est la Journée internationale de la femme. Cette journée nous porte à réfléchir sur les expériences, les parcours et les réalisations de femmes à travers le monde. Entrée libre | Buffet offert. Pour plus d`info: Mélanie Lumsden au 819 243-2345, poste 2192. 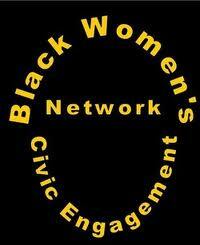 The Black Women’s Civic Engagement Network (BWCEN) and their Founding Patron the Honorable Marlene Jennings, invite you to a Cocktail Reception marking International Women’s Day. Through this event, the BWCEN will also be recognizing the contributions of two extraordinary Canadian Women, Staff Sergeant Isobel Granger of the Ottawa Police Service (OPS) and Patricia Bebia Mawa, President of Planet Africa Group, whose vision, commitment and achievements are transforming Canadian society through leadership and service. See "BWCEN" for more info on 2012 award recipients. discussed. Among these issues, we will talk about the perception of beauty over the generations, from male and female perspectives, the media’s role in these perceptions, as well as the impact of peer pressure in upholding the standards of beauty set by society, physical appearance professional environments, and the methods used to reach the subjective ideal of perfection. The funds collected will go to Step Up, a mentorship and dance program for teenage girls. 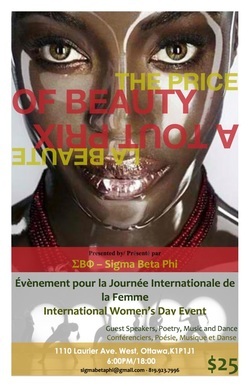 Sigma Beta Phi is a sorority whose main goal is to promote solidarity amongst women. That is why, every year, we organize an event in honour of women for International Women’s Day with those who share our interest in improving the status of women. We are celebrating this day by highlighting the modern woman and the challenges she faces daily.